Belvedere Game Ranch - Pongola Accommodation. Belvedere Game Ranch covers 1400 hectares stocked with a variety of game including Buffalo, Giraffe, Kudu, Nyala, Impala, Warthog, Bushbuck, Zebra, Bluewildebeest, red and grey duiker and other small game species. It is a paradise for bird lovers and hosts a magnificent variety of tree species. The lodge is situated in the center of the farm surrounded by lush bushveld. Accommodation is in 6 en-suite air conditioned bedrooms. The Lodge has a self catering central kitchen, lounge, dining area, bar and swimming pool. We can do full catering by prior arrangement. The farm has a network of bush tracks of 130 km you could explore with your bicycle, quad, bakkie or on foot. 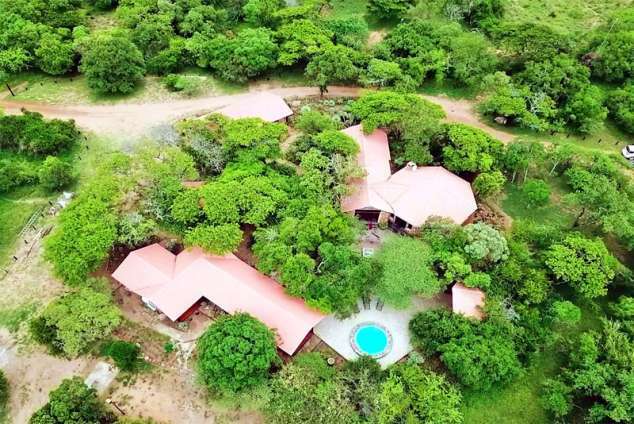 Belvedere Game Ranch provides for a totally exclusive breakaway. Jozini dam (30km) - tiger fishing or a boat cruise viewing buffalo, elephant etc and fantastic water birds. 12818 page views since 17 Jun, 2010.